In 2015 the KC Stars & KC Jr Mavs travel associations merged to become one unified travel club which is called KC Mavs and operates under KCYHA. KC Mavs travel will offer A & AA teams for Squirt, Peewee, Bantam & Midget that play in the MoHockey league. KC Jets will continue to offer JV & Varsity high school teams that play in the Midwest High School Hockey League. KCYHA is offering another travel team fundraiser for the season. Enjoy beautiful, fresh holiday evergreens fresh from the Pacific Northwest! All proceeds go back to YOUR TRAVEL TEAM to use for additional tournaments, coaches expenses, etc (just like the Papa Johns Fundraiser). This greenery and decor is perfect for the holidays! Please note - this will be our last team fundraiser for the season. ALL ORDERS ARE DUE NOVEMBER 4th! Sell to family and friends using the attached order form, collect money up front with either cash or check (please make checks payable to KCYHA). Set up a mini-website at the website below. From here family and friends can order online. However, they cannot pay online, so you will still need to collect payment from them. When will the orders arrive? Orders will arrive the week after Thanksgiving to go out for delivery. Several items are available for direct ship as well. How much does each team make per item? Your team will make $9 - $11 per item sold, and will be deposited to your team account after the sale is over. How do you turn in our orders? Please return your order forms and money to your team manager. Team managers- orders are due November 4th to Carolyn Maddox. With the holidays quickly approaching, the timeframe is very short to turn in orders. However, these items are an easy sell and something everyone can use in their homes! Carolyn will be dropping off brochures to SECA and KCIC, or you can print the brochure/order form below. Any questions? Please contact Carolyn Maddox at carolyn.griff44@gmail.com. Thank you and happy selling! This is a TEAM fundraiser, meaning any money raised will go directly to your travel team! These funds can be used for extra tournaments, coaches expenses, or anything else your team decides. Your team will earn $11 per card sold if we collectively sell more than 500 cards, or $10 per card if we sell less than 500. STEP 1: Sell Papa Johns cards to friends, family and neighbors from now until October 12th. STEP 2: Fill out the order form for each order and collect money up front (checks made out to KCYHA). STEP 3: Turn in order forms and money to your team manager (they will need to be turned in together as a team). STEP 4: Cards will be delivered approximately 3 weeks after the order is submitted, and will be given to your team manager. STEP 5: Pass out cards to everyone on your order form and start using your team funds! KC Mavs Travel Team spirit wear is offered through the Missouri Mavericks Team Store. Order forms are offered several times throughout the season. Questions? Contact Kara at 816.777.0564. 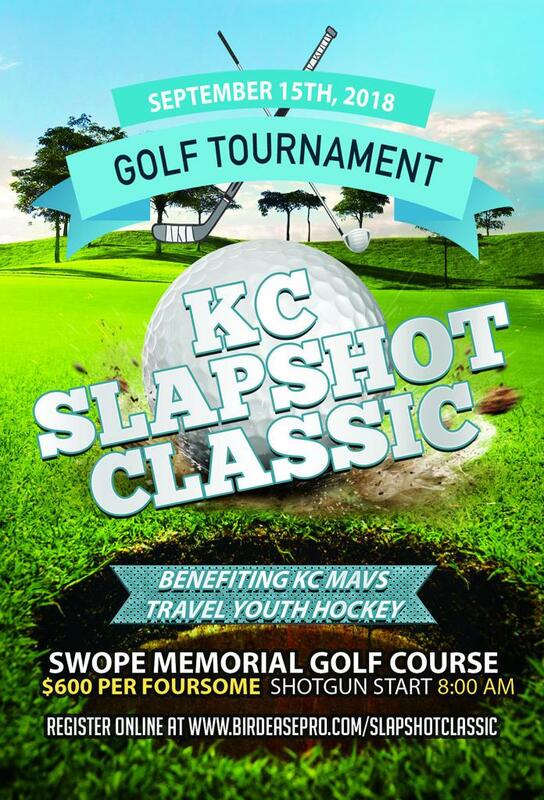 Save the Date and Register Today for the 1st Annual KC SlapShot Classic Golf Tournament supporting the KCYHA Travel Hockey Program on September 15, 2018! **Walk-Up registrations and single golfer registrations are still being taken! Would you like to be a sponsor or know someone who would? Visit: https://birdeasepro.com/Event/Sponsorships/9787 for complete sponsorship opportunities. Don't play golf but want to be involved? There are also several opportunities to volunteer for both players and parents. Questions? Contact Amy Briscoe at amylbriscoe@hotmail.com. We can't make this event great without all of you. Thank you in advance for your support!